SINGAPORE - While North Korea has held summits with the leaders of neighboring South Korea and China as well as the United States this year, Supreme Leader Kim Jong Un has shown no signs of wanting to meet Prime Minister Shinzo Abe anytime soon. Instead of signaling a desire to have dialogue with Japan, Pyongyang has steadfastly lambasted its longtime adversary to fan nationalist sentiment at home and strengthening ties with Seoul. Since Japan-North Korea relations are expected to deteriorate even more, Tokyo “should not hope that an Abe-Kim summit will take place in the near future,” a source familiar with Pyongyang’s thinking said. 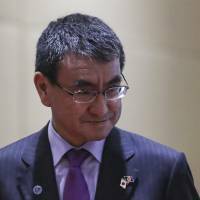 On Friday night, Foreign Minister Taro Kono chatted with his North Korean counterpart, Ri Yong Ho, on the sidelines of a series of Association of Southeast Asian Nations-related gatherings in Singapore. It was the first ministerial contact between the two countries since Abe began exploring the possibility of a meeting with Kim after the historic U.S.-North Korea summit in June, which also took place in the city-state. 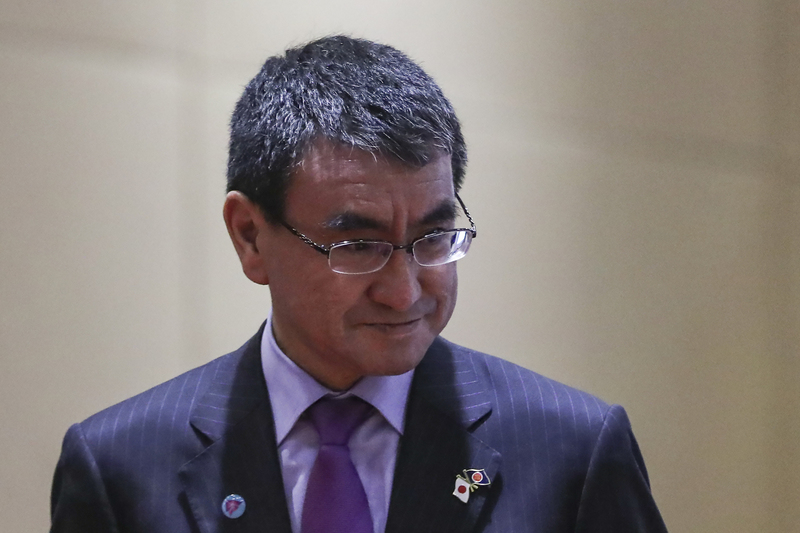 Although Kono told reporters that he informed Ri of Japan’s views and basic stances, he declined to disclose further details, suggesting their conversation may not have been held in an amicable atmosphere. As Abe wants to hold bilateral talks with Kim during international conferences in September, Kono was “urged” by the Prime Minister’s office to make contact with Ri in Singapore, a Foreign Ministry source in Tokyo said. Kono, however, was “not able to obtain any results, or might have even worsened the situation,” the source added. North Korea has recently stepped up its criticism of the Abe administration and asked Japan to atone for its military occupation and colonial rule of the Korean Peninsula from 1910 to 1945. “Acerbic comments on Japan are a cohesive to bring North Koreans together and to demonstrate Chairman Kim’s nationalist credentials,” said Stephen Nagy, a senior associate professor of politics at International Christian University in Tokyo. “Japan represents a historical experience that helped shape the emergence of a North Korea, the division of the peninsula and today’s nuclear standoff,” said Nagy, also a fellow at the Asia Pacific Foundation of Canada. “These are all part of the North Korean identity now as they have been ingrained and exaggerated in several generations of North Koreans. It will be difficult to change this view of Japan as it is so divorced from Japan today,” he added. Tong Zhao, a fellow at the Carnegie-Tsinghua Center for Global Policy in Beijing, said North Korea is unlikely to try to get along with Japan soon, given that Abe continues to take a hard-line stance against Pyongyang. Even after the historic summit between Kim and U.S. President Donald Trump, Abe’s government has repeatedly argued that international sanctions against North Korea should be maintained until Pyongyang achieves complete denuclearization as promised. But it is also pressuring the North on the abduction issue. “As South Korea, Russia and China have all taken a more flexible approach to engage with North Korea, Japan naturally becomes the next ‘nut’ for North Korea to crack,” Zhao said. Tokyo and Pyongyang have also been jousting over the abduction issue. Japan claims 17 of its citizens were abducted in the late 1970s and early 1980s. Five were repatriated in 2002, but Japan suspects North Korea was involved in many more. Pyongyang says that eight of the 17 — including Megumi Yokota, who disappeared on the way home from school at the age of 13 — died and four never entered the country. “What (is) sought by Japan in persisting in talking about the worn-out ‘abduction issue’ is to use the issue as an excuse for evading the liquidation of the past and a political slogan for the hostile policy toward” North Korea, the Rodong Sinmun newspaper of the ruling Workers’ Party said last month. Japan has insisted it will make efforts to resolve several matters such as the abduction issue before normalizing ties with North Korea based on the “Pyongyang Declaration,” a key diplomatic document signed by the two nations in 2002. “I’m wondering why Japan hasn’t tried to solve the abduction issue after normalizing relations with North Korea,” a diplomat at a European nation’s embassy in Beijing said. “Unless the Japanese government changes its policy, it cannot break down the status quo,” the diplomat said. Abe has been looking to hold a face-to-face meeting with Kim, possibly in September, on the fringes of the Eastern Economic Forum in Vladivostok, Russia, or at the U.N. General Assembly in New York.